Is a Golden retriever the right dog breed for you? 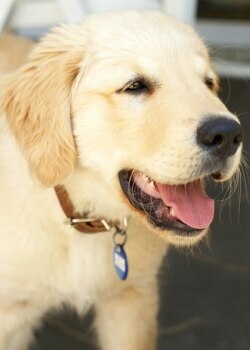 Golden retrievers are a friendly, eager to please breed originally used in hunting game and fowl. They are intelligent and quick to learn, require a lot of exercise, and do best with rigorous training. They may do an “alarm bark,” but generally aren’t watch dogs. They require a lot of human attention and affection as well as mental stimulation and play to keep them happy. Grooming is generally straightforward. 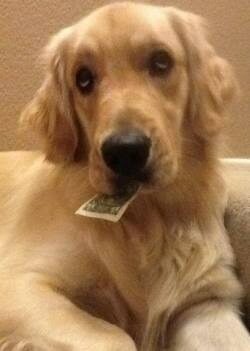 Riley, a 20 month old Golden retriever has no idea how that dollar bill got in his mouth. Photo submitted by Margaret R.
Insure your gorgeous Golden retriever with Pets Best Insurance! 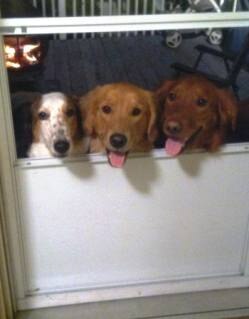 Two goldens and a mixed breed dog try to convince their humans to let them in the door. Photo submitted by Jennifer K.
Another golden named Riley, who is quite handsome. Photo submitted by Karen K.